1. Unlearn the behaviours and mindsets that prevent you and your businesses from moving forward. 2. Relearn new skills, strategies, and innovations that are transforming the world every day. The O’Reilly three-step system rang a bell when Dania Petrik, the SA Adaptation Network Coordinator, suggested that I write an article on my experience as a member of the South African Adaptation Network. I mulled over how my journey with the network has helped me unlearn deeply entrenched narratives about the story of human adaptation to climate change. I could not help but reflect on my association with the network. But how did it all begin? It all started when I enrolled for a PhD at the University of Cape Town (UCT). One of my supervisors, the affable Prof Gina Ziervogel introduced me to the world of adaptation to climate change. Under her tutelage, the most important thing I learned was to challenge what sociologist Arlie Russel Hochschild calls the “deep story”. According to Hochsfield, the deep story is a sustained narrative in a community. I remember that prior to this, my thinking was characterised by rigidity. Thus, started the journey of learning to unlearn. After UCT, I felt like a boiling kettle removed from the burner – a blissful release from the intense pressure of my PhD journey. The SA Adaptation Network could not have come into my life at a better time. I first met the SA Adaptation Network team – then, Secretariat Manager Noel Oettle, Siya Myeza and Shannon Parring – during my brief stint at Rhodes University in 2015. This was during a workshop under the auspices of the Network at Rhodes. What came out of the workshop was the need to unlearn the narrative of the silver bullet solution to climate change adaptation. This helped consolidate the insights on adaptation I already had from my days at UCT. I got to meet more people associated with the network in subsequent workshops organised by the network. These include Bettina Koelle (Indigo), Candice-Lee Arendse and Thabang Phago (CSA). 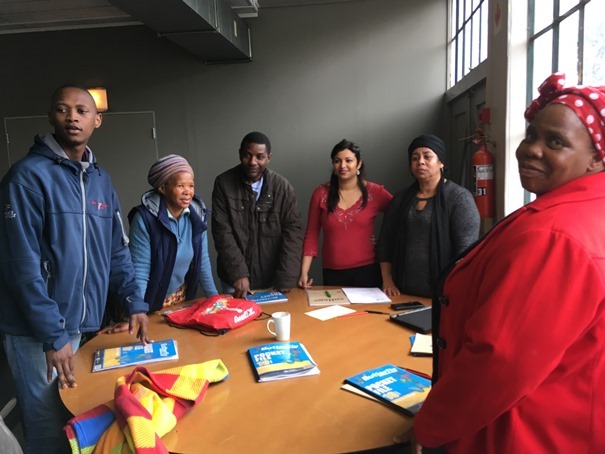 I recall how welcoming they were when we met in Noordhoek, Cape Town for the facilitation workshop in October 2017. Prior to this workshop, I had facilitated at several conferences in my native Zimbabwe. But after the workshop I realised I had undergone some kind of metamorphosis. I had unlearned several pre-conceived notions I had about facilitation. Also, what came out was what I would call the workshop ‘Rule-of-Thumb’: when facilitating always have a few tricks up your sleeve to energise workshop attendees, a rule I have taken to heart. In fact, I have used a few of the tricks during workshops I have facilitated back home. The SA Adaptation Network also sponsored my trip to Malawi for the 12th Community Based Conference (CBA) in 2018 held in Lilongwe, Malawi. During the conference, I learned about the precarious status of communities who live on the margins of survival and how they are retooling their capabilities so as to ensure food on their tables. For these communities, ‘retooling’ means to unlearn long held narratives. This helped me to question my own narratives in the climate change discourse, that there is need for novel thinking as we try to address some of the challenges that confront humanity today. To that end, the Adaptation Network is working round the clock to reach out to researchers, academics, and civil society in the southern African region working on adaptation to climate change initiatives. This is highly commendable. Thus, the Network has spread its tentacles across the region as seen by the attendees at its conferences. I am one of the beneficiaries of these initiatives by the Network and am very indebted to the Network for the gesture. I appreciate those who have been with me on this amazing journey – my friends in the SA Adaptation Network. These friends have helped me to learn to unlearn pre-conceived ideas. Unlearning is a continuous process of replacing old ideas and models with new ones in order to adapt to an ever-changing environment. This is evident as shown by how communities in the region are ever retooling their strategies. But, any attempt to engage with the community must first engage with their deep story, and yours, too, as O’Reilly would say. This entry was tagged adaptation, climate, ideas, learning, member, membership, training, unlearn. Bookmark the permalink.